The Civil War is known and remembered for many actions and speeches that took place on and off the battlefield; however, what can sometimes get overlooked or overshadowed in the midst of all the action was what kind of legislations was (or wasn’t) moving through Congress during that period. While the decade leading up to the outbreak of the war was fraught with severe divisions within Congress, once the obstructionist southern Democrats left both chambers in 1861, numerous pieces of legislation were able to finally move through, including the Homestead Act. The importance of the Homestead Act in our country’s history cannot be overstated, but it is an interesting idea to think about how if not for the Civil War and the secession of the southern states that the legislation likely would not have passed. For years prior to its passage, the Senate in particular had blocked every previous attempt to pass a homestead bill. Given its significance, I think digging a little deeper into why there was legislative opposition to the Homestead Act prior to the Civil War and why it was such a key piece of our country’s history and continued expansion westward is an important exercise. Much like every other major issue in the mid-19th century, making lands in the western territories more readily and easily available to American settlers was a divisive one. Southern plantation owners were opposed to homesteading because they feared that more small farms would begin to pop up and compete with them, not to mention the fact that they were worried that any new states created would want to ban slavery. Northern factory owners were afraid that new business opportunities opening up across the expanding country would drain their steady stream of cheap laborers. Prior to the mid-19th century, most Americans couldn’t afford to buy lands out west; with the arrival of more and more immigrants in our country, many of them wanted to seek new lives in the western territories, as well. With the property acquired after the Mexican War, more opportunities presented themselves for further settlement and expansion westward and there seemed to be a greater level of support for homesteading. The House passed homesteading legislation three times in the 1850’s—1852, 1854, and 1859— only to have the Senate fail to do so as well. When a bill finally did pass both chambers in 1860, the measure was vetoed by President Buchanan. With the strongest opposition removed from the Senate chamber by late 1861, Congress finally took up and passed the Homestead Act, which President Abraham Lincoln signed into law on May 20, 1862; this Sunday marks the 150th anniversary of the law’s enactment. The Homestead Act created a three-tier process to allow all Americans and those intending to become American citizens (the one stipulation is that none of them could have ever fought against the United States at any time) to acquire 160-acre swaths of land out west. According to the law, once the application for the land was filed, the claimant had to spend the next five years living on and cultivating the land, including constructing a dwelling that measured 12 feet by 14 feet, and by also growing crops. Following the five years, the claimant could file for his or her deed by submitting the proof of residency and necessary paperwork to a local land office for approval. The first land application was filed in Nebraska on January 1, 1863, and the last was filed in Alaska in 1979, although the law would officially be replaced in 1976 (since Alaska still had lands available, the law was phased out there in 1986). Despite the seeming ease of the application process, it was a difficult life in many areas of the unsettled west and a number of those who attempted to make a new life, simply could not and did not make it through the five year period. Once the Railroad Act was passed a few years later, which paved the way for the transcontinental railroad, life was certainly made easier in this regard, although it still was not a walk in the park. The Homestead Act helped our country rapidly increase the speed at which we were able to complete our expansion westward, leading to much eventual economic prosperity for our country. Unfortunately, while land grants were allowed for nearly every American who wanted one, including many women and African Americans, the one group who continue to get forcibly removed and displaced until they were relegated to the reservations upon which they stay today were Native Americans. Our shameful treatment of them haunts our country’s history to this very day. Overall, the Homestead Act was a law that was so significant to our country’s history for so many reasons, not the least of which was that it allowed ordinary Americans to create a home for themselves and their families and live out their version of the ‘American Dream.” Perhaps some legislation would have eventually passed the Congress to allow for homesteading and to make federal lands available and affordable for the masses, but there is no question that the Civil War made such a law inevitable. Now that the holidays have come and gone and everyone is back to work, I thought it was time to return to our continuing series of interviews with various Capitol Hill insiders, with this being the third such installment. Congressman Jason Altmire, a third-term Democrat from Pennsylvania’s fourth district, sat down with me before the holidays to talk history; we ended up having a rather lengthy and enjoyable conversation (in fact, due to the length of the conversation, we have decided to post it in two parts). Congressman Altmire’s district is in the western portion of Pennsylvania, an area steeped in the history of America’s Industrial Revolution, something the Congressman is most certainly aware of, not only because he is from the Pittsburgh area, but because he happens to be a history junkie with a fondness for that very period in our nation’s past. As will become clear throughout my interview with him, Congressman Altmire is one elected official that is highly attuned to the important role that history plays in all of our lives, especially for members of Congress, who more than anyone must be willing and able to learn the lessons that history has to offer as they attempt to guide our country through some tough economic, social, and political times. I hope you enjoy reading the first part of our exchange and that you will return in a few days to catch its conclusion! JH: OK, so I obviously have your home state and district, but where did you go to school, go to college? Congressman Altmire: I went to Florida State for college and I got my Master’s at George Washington. Congressman Altmire: And I got my undergraduate degree in political science and my Master’s degree is in health administration. JH: Oh, ok. And you were in health care before you ran? Congressman Altmire: Yeah, health policy and I was a staffer here. When I was at college at FSU, I worked on a political campaign after I graduated, a challenger running against an incumbent. He won and brought me up to DC with him, and I worked on his staff for six years doing his health care policy. At night, I went to school at GW to get my Master’s degree. When he (Congressman Douglas “Pete” Peterson, FL-2) went on to become ambassador of Vietnam, I moved over to the Federation of American Hospitals here in town and did that for two and half years. I then went home to Pittsburgh and worked at the University of Pittsburgh Medical Center from ’98 to ’05, and then I ran for this seat. JH: Excellent! And before I forget, I think I remember reading that you played football at FSU, right? JH: Nice, very nice. I was a college athlete, certainly not anywhere close to that level, but I can certainly appreciate it. Congressman Altmire: Well, I’m sure you were closer to that than I was…I was pretty low on the totem pole. JH: Yeah, I was kind of low on the totem pole too but it certainly sounds better to say you played football for FSU rather than playing soccer at Lafayette College. Congressman Altmire: What position did you play? JH: Yeah, I’m a little short obviously, but the women can get away with that more than the men. Congressman Altmire: Were you good? JH: I was good enough, I guess, I mean I didn’t start, but it was fun; I really enjoyed playing sports in college. Anyway, so were you always interested in working in DC and in politics? Was this always a goal of yours? Congressman Altmire: Yeah, well, I was always interested in history and politics growing up, but when I left D.C. in 1998 to go back to Pittsburgh, I thought I was putting politics behind me. I didn’t go home thinking I was ever going to come back, and certainly not in this capacity, so it was a surprise that I got back into it. Once I turned 30, my wife was pregnant with our first daughter, so we said “you know, let’s start our life.” So we moved back home and got normal jobs, but eventually it worked out that I found my way back here. JH: Good. And what led you to eventually run for the seat? Congressman Altmire: I was pretty active in local boards and just traveling around; I had a job that took me out into the community, so I did a lot of work with different groups, and just heard different opinions about political issues and other issues. Then, after the ’04 election, I was disappointed in the outcome nationwide, but also in our district, and I sensed there was a lot of frustration out there. So I spent the first six months of 2005 trying to find somebody else to run—talking to elected officials, local leaders, business folks—and nobody wanted to run. It was a heavily Republican district, there was an incumbent who was perceived to be very popular, and finally I just said, “If nobody else is going to do this then I’m going to do it myself,” and that’s how I got into it. Congressman Altmire: See? [Pointing to his book shelves lined with biographies of historical figures] I put all of these books up here for you. JH: (Both laughing) Perfect! In terms of your favorite kind of history, what’s your favorite period, area of the world, U.S.? What are you most into in terms of history? Congressman Altmire: The short answer is that if I could go back and live in any period of time, which is, I think, kind of what you’re asking, it would be the late 1800s era, and I’ve always been interested in that period. When I read books I purposely switch eras—I won’t read Adams and Jefferson back-to-back, but I’ll go from Adams to Woodrow Wilson to Reagan to Andrew Jackson because I just like to mix it up. In American history, of course, compared to world history we have a much shorter time span for our history, but I think that 1800s era is my favorite. Maybe it’s because I’m from Pittsburgh and it was the Industrial Revolution, but—you know, all of the old pictures of London from that period of time too, so it’s not just America—I’ve just always been interested in that era. JH: Yeah, I enjoyed teaching the 19th century in world history. I actually taught a lot of world history in particular before coming here, but it was definitely an interesting time in the history of the world. So, why do you think history is so important? Congressman Altmire: Well, it’s critical. You learn from the past so you don’t make the same mistakes in the present. And maybe it doesn’t exactly repeat itself, but the same situations occur over and over again, and if you don’t learn the lessons of the past you’re doomed to repeat them. I’m not the first to say that obviously. You know, I think there are some people here that just don’t understand history. So, what you’ll find is—and this is not a partisan statement, this is just my observation of reality—that some of these Tea Party folks who came in claiming to represent the Constitution, and holding up the Constitution thinking that it’s their point of view, I don’t think they understand history. If you go back and read the Federalist Papers, which they [Tea Party] always quote—Madison, Jay, and Hamilton—this is what they say; however, that was a discussion, a national discussion, sort of the equivalent of a back and forth on an email at that time, with one side publishing something and then the other side responding. So, you had George Mason and Patrick Henry, folks like that on the other side, and if you go back—it was a very public debate—and read what the Patrick Henry group was saying, what the Anti-Federalists were saying, that sounds a lot more like the Tea Party than the Madison group. Now, history is written by the winners so they have that point of view and that’s their frame of reference, and the current, modern folks read that and say, “oh that’s my point of view too;” but the George Mason and Patrick Henry crowd was saying, “I want you out of my life, I don’t want the government to be a part of anything, get it out. I don’t want any taxes, stay away from me and let me do my own thing.” That sounds a lot more like the Tea Party philosophy, so I don’t think they understand it. Then a guy like Thomas Jefferson, who lived to be 83 years old, every waking moment, every thought he had he wrote down on paper from the time he was 16, so you can find something Jefferson said or wrote to back up anything. Over the course of anyone’s lifetime you change your mind, you have different frames of reference based upon what period you’re writing it in. And so they [Tea Party] go back and they pull quotes out from Jefferson, but you can just as easily do it from the other side, out of context no less. JH: Sure, yeah. Do you think that history is…? Congressman Altmire: Something like the immigration issue—you want to talk about history repeating itself, go back and look at what we said in WWII with the internment camps in relation to what happened after September 11th and there’s that. With illegal immigration along the southern border you could go back even further and look at the Italian immigrants and the Irish immigrants at the turn of the twentieth century. The Chinese immigrants on the West Coast were greatly mistreated when they first got here, which is a very similar analogy, and that was in the Theodore Roosevelt era that that happened. You can go back and pull one name out of the history books and insert a modern name and in a lot of cases it fits right in. JH: In terms of education and what’s being taught in schools, do you think history is emphasized enough today in schools? Congressman Altmire: It’s not. I’m on the education committee and we deal a lot with No Child Left Behind, where we only test in math, science, reading, and writing and we don’t test in history. So, schools have no incentive to teach history or to even ensure their students are competent in history because they don’t benefit from good scores and the students aren’t tested for it, which is a big mistake. I think that history and civics also need to be tested for, along with the arts, which are critically important. You know we talked about athletics before, and you hear so much about our obesity epidemic in this country, so physical education should be a part of any school experience. That’s a much longer discussion, however, but no, history isn’t emphasized enough. JH: Oh yes and I have plenty to say myself on the issue of No Child Left Behind (laughing). Congressman Altmire: Yes, I’m sure you do (laughing). JH: How conscious are you of the history of Congress in your job on a daily basis? Congressman Altmire: Well, I don’t know comparative to other members and certainly not to a historian how much depth I have on history, but I think I have a fair amount, and I do think about it all the time when I walk around. I mean, there are so many references to Henry Clay, and so I think about him. When I walk past the old Senate chamber and I can’t help but hear the echoes of Daniel Webster, even Andrew Jackson when he was a Senator, and all of those folks. So, yeah, I think about that, I think all of us do when we walk around. You can’t help but know that others have walked before you. That’s why I have that picture of Lincoln right there [pointing to a framed picture on his office wall] and that’s from when he was in the House. JH: Yeah, I was going to say it must be from when he was quite young. JH: …I know, and all the way in the back of Statuary Hall there and you realize, hey, he was just a regular representative when he was there. Congressman Altmire: Yeah, just one term, that was it. JH: And no one realized at that point what kind of impact he would have upon history at that point. This concludes part one of my sit down with Congressman Jason Altmire, with the second half appearing on Friday. As I mentioned in the introduction to this interview, Congressman Altmire definitely has a firm grasp of history, which is on full display in the first portion of our conversation and will be just as evident in the second part. I hope you enjoyed this and that you check back Friday to hear about his favorite anecdote of congressional history, as well as some other fun and interesting stories from the Congressman that no history buff will want to miss! 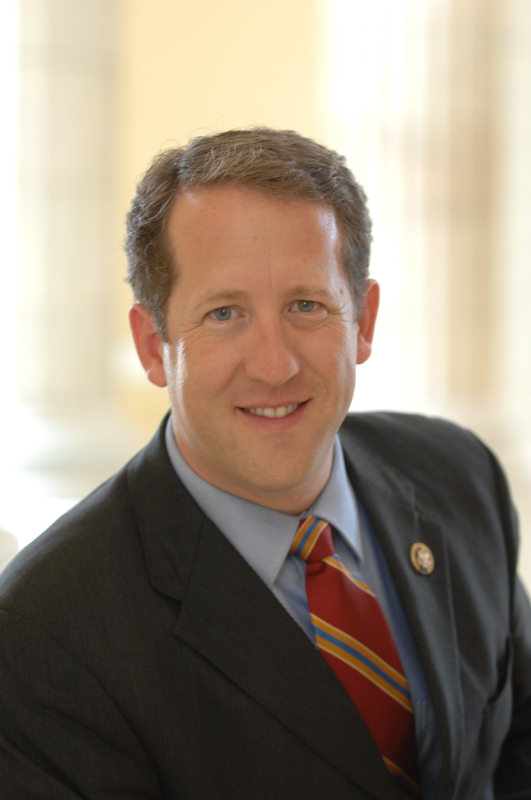 For the second in our series of interviews with Capitol Hill insiders, I am very pleased to share the thoughts and insights of Representative Adrian Smith (R-NE). I also happen to know the Congressman through my graduate work at GW; I had the privilege of learning directly from him and from his Chief of Staff, Jeffrey Shapiro, who co-taught a phenomenal course last spring called “Running and Ruling: A Member’s Perspective.” I must say that I was very awed by the chance to take a class co-taught by a member of Congress and his chief of staff, not to mention some of the guests they brought in to speak to our class (Congressman Kevin McCarthy, the House Majority Whip, was among them). To go from teaching about history and government to getting first-hand insights and stories from someone who will forever be in the annals of congressional history was pretty exciting for me, to say the least. In continuing with his commitment to and early background in education, Congressman Smith devoted his scarce time to my graduate class as he has once again done here for us at the U.S. Capitol Historical Society in our effort to fulfill our mission to educate and inform the public about the history of the Capitol, the institution of Congress, and all those members who have and continue to serve in its chambers. If you read our previous interview with Dr. Rodney Whitlock, Health Policy Director for Senator Grassley (R-IA), you may notice that some of the questions are the same or similar, while others are quite different; however, regardless of the questions, the answers provided by Rep. Smith offer a very unique glimpse into how history plays a role in the inner workings of Congress and its members. I hope you enjoy! JH: What is your home state and district? Rep. Smith: I am a sixth-generation Nebraskan. I proudly represent the people of the state’s Third Congressional District. JH: What was your major in college/grad school? Rep. Smith: I received an undergraduate degree in Education from the University of Nebraska. JH: Were you always interested in working in DC and in politics? If not, what had you originally planned to do? Rep. Smith: Actually, no. My parents were educators and I originally wanted to follow in their footsteps. JH: What led you to run for office? Rep. Smith: I became very concerned about the direction of our country and had a desire to be involved in the policymaking process. JH: What is your favorite historical period and area (world, American, European, etc.)? Rep. Smith: The Revolutionary War period is my favorite historical period because it chronicles the founding of our country and the views of the Founders. JH: How conscious are you of the history of Congress in your job? Rep. Smith: If we are going to move the country forward, we must look at our past to figure out what Congress did right and what it did not. Each day I serve, I am more inspired by the foresight of our Founders. JH: How do you, for lack of a better word, interact with history on a daily basis in your job? Rep. Smith: With each new day there is more history to learn. I understand how important it is to maintain records and documentation of the legislative process so we can have something to draw from during future policymaking. JH: Who held your seat before you did? Is there any historical significance to your particular district or seat that people aren’t aware of? Rep. Smith: Tom Osborne represented the Third District before I was elected. I reside among the most documented landmarks, such as Chimney Rock, on the Oregon Trail, the path which countless settlers took to settle the West crosses through nearly the entire district. In fact, I have a photo hanging in my office of every Representative who has served the Third District. JH: Do you think elected officials pay enough attention to history in doing their jobs and in making their decisions? If not, do you think they should and if so, do you have an example you can share? Rep. Smith: Here’s a good historical perspective: I can’t think of a single nation in history which taxed, borrowed, and spent its way to prosperity. JH: If you were asked to teach a high school history lesson on any historical topic/event of your choosing, what would choose and why? Rep. Smith: I would choose to talk about how my great-grandparents immigrated to the United States from Europe during the 19th Century to become migrant farm workers in Nebraska. I think it is a great example to use to discuss the heritage of our state. JH: What’s your favorite story of congressional history that you’ve heard since becoming a member of Congress? Rep. Smith: My favorite story would have to be surrounding President John Quincy Adams’ death in the old Speaker’s Room. He is the only person to serve in the House of Representatives after having been President. Today, the room serves as the Ladies’ Lounge and the couch on which he died has since been restored and returned to the room. I am also a big fan of that John Quincy Adams story, and just to elaborate on it a bit for those who may not know the whole story, the former President suffered a stroke while at his desk in the old House chamber where, as Rep. Smith just pointed out, he served for 17 years following his term in the White House, passing away two days later in what is now the Ladies’ Lounge. How can you not love a good historical anecdote? Anyway, I hope you enjoyed hearing the insights of Congressman Smith; clearly, he is a member of Congress who appreciates and acknowledges the history of the chamber he works in, the institution he is a part of, and the lasting importance of the decisions he makes there every day (I would imagine most members of Congress are no different in those respects). I again thank him for taking the time out of his very hectic schedule and giving us the chance to hear answers to some questions I’m sure the Congressman does not get asked very often. Make sure you continue to stay tuned to our blog to see who pops up next in our “Insider’s Guide” interview series. Do you have a member of Congress or a particular staff member you would like to hear from? What about a historical question you’d like answered? Be sure to let us know and to give us your feedback! As most everyone knows, today marks the 70th anniversary of the bombing of Pearl Harbor by Imperial Japan, thrusting us into World War II and forever changing the United States of America and the world. 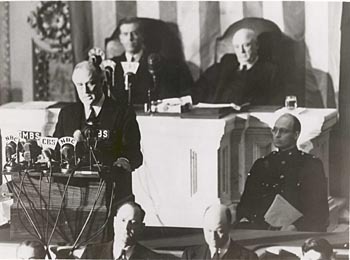 While many people focus the bulk of their attention on the events of December 7thand the impact that the bombing of Pearl Harbor would have upon us as a nation, we thought that perhaps we might look more closely at the following day, as the focus came upon the Congress and arguably the most famous and important speech ever delivered by a president to a joint session of Congress in modern history. FDR’s address to Congress asking for a declaration of war against Japan for its attack on us the previous day, in what became known as his “a date which will live in infamy” speech, is still remembered by many an American who lived through it and the millions more who have and still do learn about it each year in school. Whether it was actually Bud Brown in the picture or not, it is still an absolutely remarkable story about a moment in history that was so profound and so deeply impacted the lives of every American. Teaching about history, reading about it, even seeing live footage of some major event, all of these can convey a basic idea or concept, but nothing can take the place of being able to experience history as it happens and where it happens, something that Bud Brown can certainly attest to. 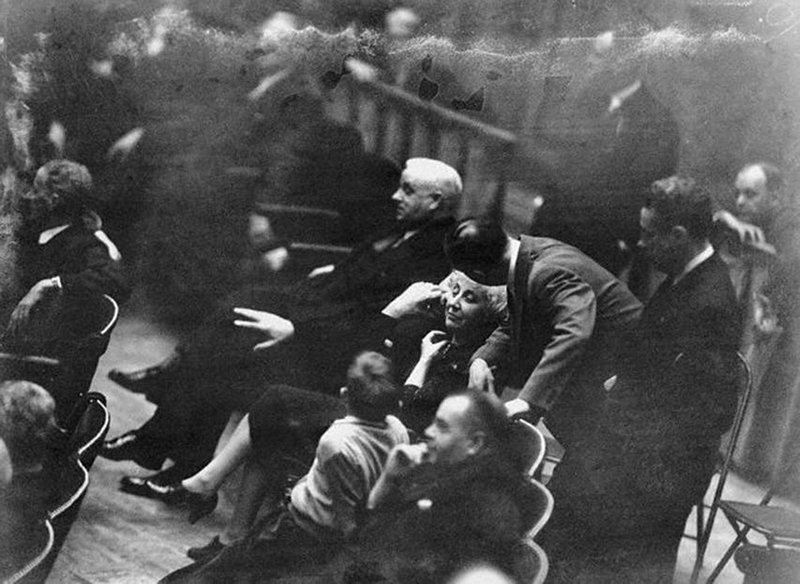 Another (current) member of the House of Representatives, John Dingell (D-MI), was also on the floor of the House to witness FDR’s historic speech, as he was a House page at the time. Currently the longest-serving member of the House, Rep. Dingell recalled his experience as a page in a recent speech he gave when accepting the Freedom Award from USCHS just a few weeks ago. Additionally, in my interview last week with Dr. Rodney Whitlock, Health Policy Director for Senator Grassley, he made mention of a moment he had with Rep. Dingell that gave him pause, in which the Congressman pointed at a picture of FDR giving the speech and remarked that he was there that day. Not only was he there to hear that speech, but like so many others who were actually serving in Congress at that time, Rep. Dingell went off to fight in WWII. In addition to those who witnessed the speech, other current members of Congress, Senator Akaka and Senator Inouye, fought in the Pacific theater during the war. Sen. Akaka actually witnessed the attacks on Pearl Harbor on December 7th, as he was in his military school there, high up on a hill, watching as the unthinkable unfolded before his eyes. Both men spoke with USCHS for an oral history series, “Yielding the Floor,” not long ago. (By clicking on either Senator’s name above, you will be linked to their interview in this series, which includes a link to a pdf transcript; a drop-down menu near the top of the page provides access to all of the interviews in several series.) Without question, their stories are quite something to hear and I highly recommend you do so. There is no doubt that the history of the Capitol and the Congress is rich, with so many amazing moments and stories to choose from and to point to as pivotal in our nation’s history. While one could make arguments about speeches and events in our early history that were more profound in shaping our nation, I would argue that there is certainly no more important moment in modern history than our entry into WWII, which began with an attack seventy years ago today, and a speech and a vote seventy years ago tomorrow. Being not a member of the “Greatest Generation” but instead a member of “Generation X,” I suppose I could make an argument that September 11, 2001 was as pivotal a moment in our modern history as the bombing of Pearl Harbor was; however, being a student and teacher of history, I still believe the events of December 7-8, 1941 led to more profound changes and impacts throughout the world in both the short- and long-term than any other event since the dawn of the twentieth century. One more interesting thing to note is that December 8th, 1941 was the last time Congress formally declared war upon another nation, which hopefully makes you stop and think a little about why that is and what it means. As I did when I wrote about Veterans Day, I must thank all of those who fought the good fight in World War II to help preserve democracy and freedom, not just for the United States, but for the entire world. They were participants in essentially the last “total war,” with every citizen making a sacrifice or a contribution—whether by fighting, by rationing food and gas, by stepping into the factories to ensure our military was well equipped, or by buying a government war bond. In a day and age where it is so easy to forget we are fighting two wars, I tip my hat and say thank you to that greatest of generations for all they have sacrificed and given to us. The U.S. Capitol Historical Society initiates a new feature presenting recently published books on congressional or Capitol history for the attention of our readers. If you have a recommendation for a book to add to the Capitol Bookshelf, please contact us (see end of this post). 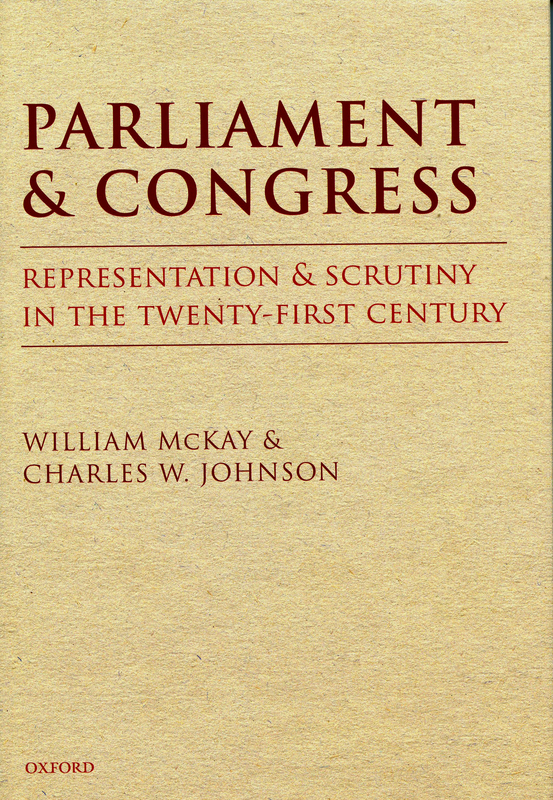 William McKay and Charles W. Johnson, Parliament and Congress: Representation and Scrutiny in the Twenty-First Century (Oxford University Press, 2010), 596 pp., hardcover, $160. The authors of Parliament and Congress are uniquely qualified to have written the most up-to-date comparative study of the constitutional backgrounds and procedural histories of the legislative bodies of the United Kingdom and the United States. William McKay served in the Department of the Clerk of the House of Commons 1962-1994, clerk Assistant of the House of Commons, 1994-1997, Clerk of the House and Chief Executive of the House Service, 1998-2002, and Interim-Clerk designate to the Scottish Assembly 1979. Since 2006 he has served as an observer at the Council of the Law Society of Scotland. 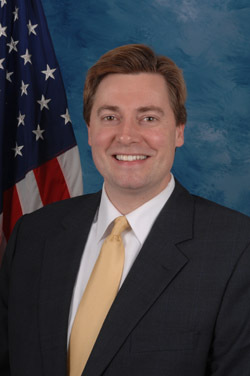 Charles W. Johnson is a consultant to the Parliamentarian of the U.S. House of Representatives. He has served as Assistant Parliamentarian to the U.S. House of Representatives 1964-1974, Deputy Parliamentarian 1975-1994, and Parliamentarian 1994-2004. The book is the successor to a book of the same title first published in 1972 by Kenneth Bradshaw and David Pring. Rather than an updating of Bradshaw and Pring, Mackay and Johnson have produced “an entirely new view of the two legislatures, sometimes more optimistic than theirs, sometimes not.” The strengths of this new work are many. In the first two chapters, it provides a basic summary of the political theory behind the two systems of government—parliamentary and congressional. Chapters three and four, “The Four Houses” and “Representatives, Members, Lords, and Senators,” contain indispensable information on the structure and history of each respective legislative body. The fifth chapter, “Procedural Basics,” explains the rules of procedure in legislative debate—essential reading for the avid C-SPAN viewer. “The Power of the Purse,” the sixth chapter, explicates one of the sharpest differences between the two systems. The House of Commons can only vote on money bills introduced by the Crown, while in the United States the House of Representatives controls the power of the purse by originating revenue measures. Subsequent chapters on “Scrutiny and Oversight,” “Committees,” “Legislation,” Privilege and Contempt,” and “Ethics and Standards,” examine other similarities and differences in the two systems, with particular attention to the developments of the last forty years. Given recent national and international fiscal and governance problems, this chapter, one of many which will be revisited by a preface to a new edition in 2012, may draw particular attention if only to demonstrate the complexity and failures which have attended the matter in the past several years. The book presented the authors a unique opportunity to be critically judgmental in their evaluations of their institutions, an opportunity not earlier presented during their 40-year nonpartisan careers. No doubt because of the technical nature of the book, Oxford University Press has priced and marketed it as a textbook/reference work. The price tag alone unfortunately will make it difficult for most readers to purchase and even for many local libraries to add it to their collections. If you can’t find the book at your local library, make a recommendation that the library add it to their acquisitions list. There is an interesting transcript of an interview with Mr. Mackay and Mr. Johnson by Brian Lamb on C-SPAN. One particularly interesting part of the discussion is the two men’s observations on the impact of televised coverage of the proceedings in Congress and Parliament. Send us your recommendations for books to add to the Capitol Bookshelf. Books should be nonfiction, pertain to the history of the Capitol or Congress, and have been published within the last 2 years. Fill out the form below or leave a note in the comments. This year’s recipients are Senator Daniel Inouye (D-HI) and Representative John Dingell (D-MI), both of whom are currently the longest-serving members of their respective chambers in Congress. In reflecting on this ceremony, which takes place tonight, November 17, we decided to take a closer look at a few other memorable long-serving members of Congress. Enjoy! James Strom Thurmond was born in Edgefield, South Carolina on December 5, 1902, and prior to serving in the United States Senate, he had a varied and interesting succession of careers, including: public high school teacher; Superintendent of Education in Edgefield, SC; became a lawyer and served as a city and county attorney; member of the SC State Senate; circuit court judge; Major General in the US Army Reserve during WWII, serving in both Europe and the Pacific; Governor of South Carolina; and unsuccessful presidential candidate for the States Rights party. Thurmond’s life before becoming one of the longest-serving Senators in American history was clearly very rich and filled with many experiences that would serve to shape his political and personal views on a number of key issues. For instance, his service in the Army during WWII in both the European and Pacific theaters, for which he won the Bronze Star and the Croix de Guerre, helped solidify his life-long commitment to supporting the Army during his tenure in the Senate. Thurmond attained national prominence when he ran for the presidency in 1948, well before he began in the Senate. This candidacy came after Hubert Humphrey (the mayor of Minneapolis at the time) called on the Democratic Party to embrace a civil rights platform at the Democratic convention, leading several southern states to walk out. With Thurmond at the helm, they began a separate effort to capture the presidency by winning enough southern electoral votes to force a vote in the House of Representatives to decide the winner of the election. Despite Thurmond getting 1.1 million popular votes and 38 electoral votes, Truman still emerged the victor; however, his candidacy that year began the shift of white southerners away from the Democratic Party, a process that was continued in 1964 when most Southern Democrats switched to the Republican Party, including Thurmond. While Strom Thurmond was already a nationally recognized figure, he had yet to land in the chamber where he would spend over 47 years of his life. So how did Thurmond get to the Senate? Not the way you would expect. After an unsuccessful run at a seat in 1950, he was able to win as a write-in candidate—still as a Democrat, at this point—after the sitting senator, Burnet R. Maybank, died two days before the deadline for certifying the Democratic Party’s nominee. The South Carolina Democratic Committee decided not to hold another primary and instead chose a candidate to back, one of Thurmond’s political rivals. Thurmond used their choice to his advantage and was able to win the write-in vote and thus the election. As he promised the voters, Thurmond resigned in 1956 to open the primary for any person to oppose him. Nobody did, and he returned to the Senate in the fall of 1956 and stayed there until 2003, the year he passed away at the age of 100, having been the oldest person to ever serve in Congress. 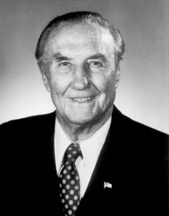 Strom Thurmond was probably best known for his opposition to integration and civil rights—not to mention the fact that he fathered an out-of-wedlock daughter with a biracial woman, much to the surprise of all who knew his views on race and race relations—which was most notably highlighted by his record-breaking one-man filibuster of a bill that would create a civil rights commission and a civil rights division in the Justice Department, outlaw efforts to prevent people from voting in federal elections, and allow the attorney general to file lawsuits as a means to stop discrimination in education, voting, and other areas. Thurmond began speaking at 8:54pm on August 28, 1957 and kept going until 9:12pm the next day—it is said that he took steam baths prior to undertaking this effort to avoid having to take bathroom breaks. Despite all of this, the bill would pass two hours after Thurmond ended his filibuster, the first civil rights legislation the Senate had passed since 1875. Perhaps no person in American history has been more controversial in the role of Speaker than that of “Uncle Joe” Cannon, who was born in Guilford County, North Carolina in 1836 but represented Illinois. A lawyer who would become a prosecutor, a post he was asked to maintain during the Civil War by the governor of Illinois, Cannon’s first run for the House came in a failed bid in 1870, though he ran successfully in 1872. Cannon was definitely not known as a brilliant legislator but was a fiercely loyal party member. Despite a failed run at the Speakership in 1888 against Thomas “Czar” Reed of Maine, as a member of the Rules Committee and the Chairman of the Appropriations Committee he was still a key lieutenant of Reed’s and a very powerful member in his own right. With Reed’s resignation and the Republicans retaking the House in 1902, Cannon ascended to the Speakership in 1903 beginning a very controversial and memorable tenure that would transform both the role of the Speaker and the House Rules Committee forever. Cannon became the first Speaker since 1861 to meet on a regular basis with the president, (Teddy Roosevelt at this point), which demonstrated the power that Cannon held within the House. Cannon was very opposed to many of the progressive inclinations of Roosevelt and proved to be a major challenge to much of President Roosevelt’s agenda, but the two men found ways to work out their differences and have a relatively manageable working relationship. It was within the House of Representatives, not the White House, where the real trouble was brewing for Cannon. Cannon’s tenure as Speaker was notable for a number of reasons, but mostly for how it ended. The growing displeasure from members of both parties was clear for all to see, best illustrated in the split between those members who wanted change—known as Insurgents—and those who, like Cannon, resisted it—known as Stalwarts. Cannon’s strength came from his dual role as Speaker and chairman of the Rules Committee, which allowed him to control what bills came to the floor of the House for votes. Cannon would also appoint his followers to other important committee chairmanships and control the number of members on committees to better serve his interests. For all intents and purposes, Speaker Cannon practiced absolute rule over the House and its business, and a disgruntled group of congressmen, intent on seeing things change in the House, knew the only road to change came by getting rid of Cannon. The coup within the House that eventually spelled the end of Cannon’s speakership began to take shape in early 1909, led by Congressman George Norris, a Republican from Nebraska. The Insurgents in the House introduced a number of resolutions designed to reduce the power of the speaker by ending his ability to appoint committee chairs and members, but none of them went anywhere. Cannon and the Stalwarts continued to counter the efforts of the Insurgents, so the Insurgents knew they had to go much further if they were to succeed. The opportunity finally presented itself on March 7, 1910, when George Norris rose to offer a resolution that he claimed was privileged by the Constitution. This move was in response to a ruling the Speaker himself had made the previous day that if a resolution was constitutionally privileged then it could bypass the Rules Committee and go immediately to the floor for a vote. Norris saw the opening that was presented to him and took it. He had in his pocket a resolution to change the rules of the House, and he took it out and waited for Cannon. After a brief pause, Cannon allowed Norris to read it. This moment was the beginning of the end for Cannonism. Norris’s resolution proposed to increase the Rules Committee membership to fifteen members that would reflect a geographic distribution, as well as proposing the committee choose its own chairman. Lastly, it proposed that the speaker would not be allowed to sit as a member of the Rules Committee at all, a major blow to Cannon. After a long debate over a point of order that the resolution was not privileged, the Speaker ruled to pass the point of order and that Norris’s resolution was not, in fact, privileged. The House Democrats then did something unusual and stunning: they appealed the speaker’s motion. This forced a vote of the whole House, which voted to overrule the speaker by a count of 182 to 162…Uncle Joe’s iron-fisted rule had finally come to an end. Speaker Cannon, for whom the Cannon House Office Building is named, came to power during a period in the House in which leadership was incredibly strong. The power that had been concentrated in the speakership became too far-reaching and prevented the House from operating the way it was meant to, and changes had to be made. In large part due to Cannonism, the Republicans would lose control of the House in the 1910 midterm elections and handed over the Speaker’s gavel in March 1911. Uncle Joe continued to serve in the House until 1923, when he retired at the age of 87. He passed away three years after that, bringing an end to a life that would be forever synonymous with power in the House of Representatives. Sam Rayburn (D-TX), for whom the newest House Office Building is named, served over 48 years in the House, including about 20 years as speaker. When he died in 1961, he held the record for the longest continuous service in the House. Rayburn supported both John Nance Garner and FDR’s New Deal early in his career; later, he repaid his political mentors by taking other young members of Congress under his wing, including LBJ. He was famous for his personal integrity, refusing lobbyists’ money with regularity. Another New Deal Democrat, Robert Byrd (WV), had a more controversial tenure, but earned a similar respect from colleagues for his knowledge of the Senate and its rules. Like Thurmond, Byrd was dogged with criticism over his early involvement with the Ku Klux Klan, which he strongly repudiated later in life, and his inconsistent record on civil rights legislation. Byrd was willing to work across the aisle, able to change positions that became untenable over time or as his viewpoints changed, and famously shameless about bringing projects and money to West Virginia. When he died in 2010, Byrd was the longest-serving member of Congress, having been in the House for six years and the Senate for 51, and was beloved for his defense of the Senate and Congress as institutions. While on a recent vacation in Bermuda, I had no idea that a chance walk up an alley in St. George’s would bring me face to face with Capitol history. and set up a barber shop on this site. the United States House of Representatives. Intrigued, I consulted the biographical essay on Joseph Hayne Rainey in the Black Americans in Congress website created and maintained by the House of Representatives. There you will learn that indeed Rainey had fled to Bermuda in 1862 after he had been conscripted into service by the Confederacy to work aboard a blockade runner and to dig trenches to fortify Charleston. 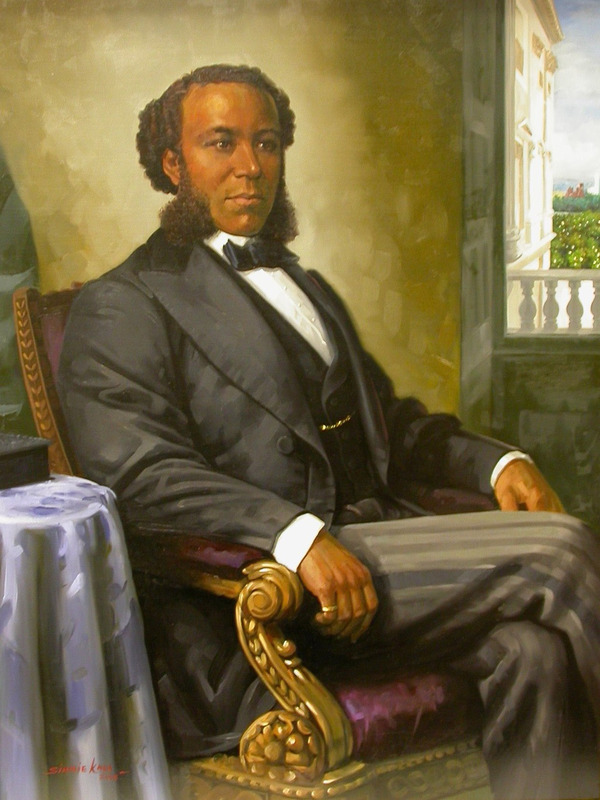 Rainey’s father, who was a barber, managed to buy his family’s freedom in the 1840s. 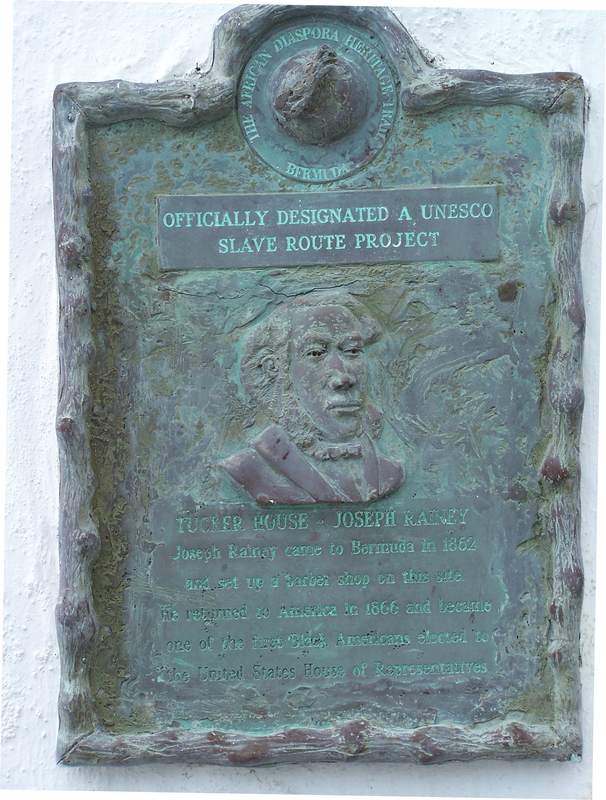 Joseph, born in 1832, learned the trade from his father and used it in Bermuda to build a successful business. As Walter Bristol Douglas details in his scholarly study, Knights of the Razor: Black Barbers in Slavery and Freedom (Johns Hopkins University Press, 2009), African American barbers held a higher status and achieved greater prosperity than most black workers, in spite of restrictive laws and racial discrimination. Why did Rainey and his wife flee to Bermuda? Most likely because the island, which lies some 670 miles east-southeast of Cape Hatteras, was an important stop for the ships engaged in running the Union blockade of the Confederacy. As Cyril Outerbridge Packwood reveals in Detour—Bermuda, Destination—U.S. House of Representatives: The Life of Joseph Hayne Rainey (Baxter’s, 1977), business boomed in Bermuda as the island “teemed with sailors from all over the world, adventurers, Northern and Southern spies. … Local merchants did extremely well during this ‘easy come, easy go’ period. Such was the setting Joseph Hayne Rainey stepped into.” He established his barber shop in the converted kitchen of the Tucker House, advertising “Hair-Cutting, Shampooing, Shaving, &c, &c, Executed in Artistic Style.” His wife also went into business as a dressmaker. Slavery had been abolished in Bermuda in 1834 and the Raineys were welcomed into the island’s free black community. Joseph became a member of the Alexandrina Lodge of the Grand United Order of Odd Fellows in Hamilton, the capital of Bermuda. Bermudans so highly regarded Rainey that they named the street where his shop was located “Barber’s Alley.” When Rainey returned to South Carolina after the war, he benefited from his status to rise in the Republican Party and to serve in the state constitutional convention and the state senate. 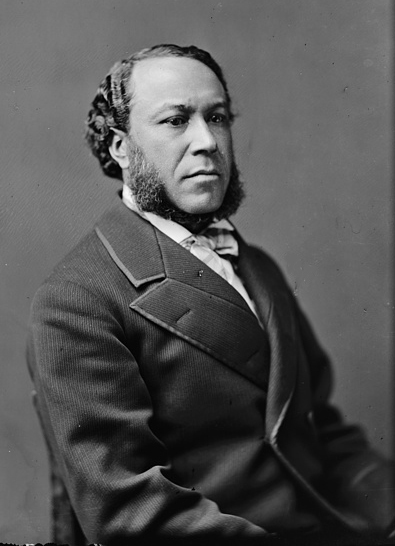 He then won the election to fill a vacancy in the House of Representatives that made him the first African American member of the House when he took his seat in December 1870 (Hiram Revels of Mississippi, the first African American senator, preceded Rainey in Congress in February 1870). To learn more about Rainey’s congressional career, see the biographical essay on the Black Americans in Congress web site. Have you perchance stumbled upon a Capitol history connection in an unexpected place? Let us know. Congressman Fred Schwengel of Iowa (May 28, 1906 – April 1, 1993), the founding president of the United States Capitol Historical Society, was proud of his German heritage. His father immigrated to the United States from Germany in the early 1900s, just a few years before Fred was born on a farm near Sheffield, Iowa. In oral history interviews conducted by Frank van der Linden in the early 1980s, Congressman Schwengel recounted how he had been shaped by his German heritage. A few sample excerpts from those interviews follow. 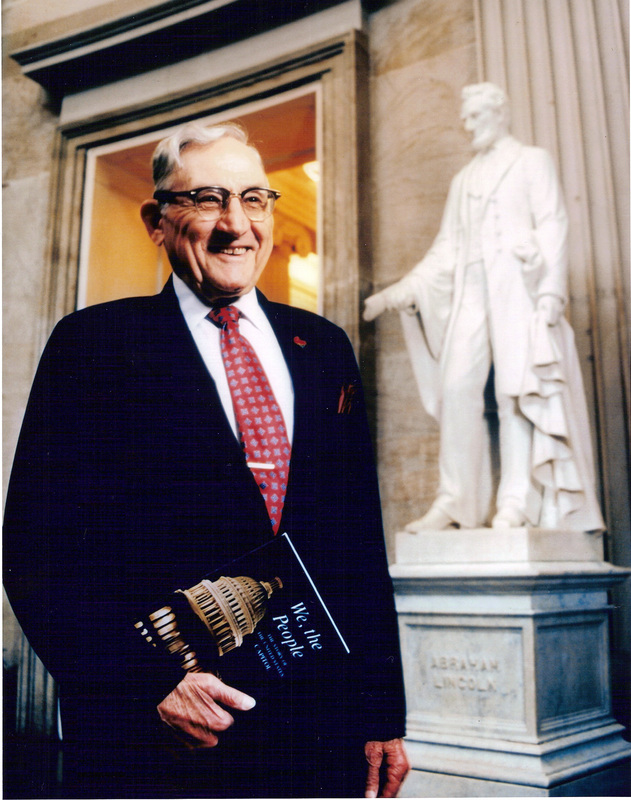 Fred Schwengel in the Capitol’s rotunda, c. 1980s, with USCHS’ first publication, a guidebook to the Capitol. Q. Mr. Schwengel, let’s start from the very beginning. Let’s start with your birth, and boyhood, and parents, all your background. Schwengel: Well, I was born outside of Sheffield, Iowa, about three miles south and a little east of what was called the Bird Farm, May 28, 1906, I think. For some reason, they did not record my birth at the courthouse, so I am using that date as the correct date, which I believe it was. My father and mother were both immigrants from Germany. They knew each other in Germany. My mother came several years before my father. I have never established, for sure, that he came over here because of my mother. … He came from Westerstede, which is in the province of Oldenburg, not far from Bremen, probably about 70 kilometers. Q. What was your father’s first name? Schwengel: My father’s first name was Gerhardt. Q. What was your mother’s name? Schwengel: My mother’s name was Marguerite. She was known by the name of “Mattie” and her maiden name was Stover. The Schwengel name is interesting, also. I should insert that here. It is spelled the German way, “S-c-h-w-e-n-g-e-l.” The name “Schwengel” is really the bolster part of a wagon. I mention that because my family are descendants of the Zwingli family, the same family as Ulrich Zwingli, the Reformer. I believe, according to my father, that we were descendants of his brother. Ulrich, of course, was the great Protestant reformer at the time of Martin Luther, in Switzerland. It’s the Swiss version of spelling, “Z-w” instead of “S-c-h-w” as in German. My father was an interesting man, and it may be worthwhile to recall why he came to America. Both my parents were members of the Baptist church in Germany. That’s different, because normally Germans are either Lutheran or Roman Catholic. But my father came from a Protestant group that believed in the Free Church. I like to think, although I have not established this, that there is a direct line of thought dating back to Ulrich, because this was his belief. Q. How did they happen to go to Iowa? Was it free land? Obviously fertile land? Schwengel: Germans, if you know anything about them, are kind of clannish. So, for some reason members of the family and friends came to Sheffield. That was a good farming area and it was fairly easy to get to by train in that period, soon after the Civil War. They were all Baptists, German Baptists, that came there. Later some Lutherans came there also. But the German Baptists congregated there. My father left after he had served two years in the Kaiser’s army. He did not believe in military service. He was drafted and forced to serve. He said many times that he wanted to raise a family in a place where they would not be drafted into the service, not required to give military service. My father never lost his interest in religion. This is an interesting thing. We always had worship service every morning, in German, at breakfast time. We sat around the breakfast table. My father would have a Bible reading, and sometimes a little lesson with it. Well, there were days when you couldn’t go out and plow—it would rain or there would be a snowstorm, or something. That was the day we sat around the table and our father would talk to us. Often, he talked about how fortunate he was that he came to America so that we could be born in this great country. He talked about being involved. Immediately, when he came here, I later found out, he made application for citizenship. In five years he passed his examination and became a citizen. He was as proud as he could be to be a citizen of America. He told us about that very often. By this time we were in this country school, District Number Nine, West Fork township, Franklin County, and, by golly, as soon as he became a citizen, they elected him to the school board. You know, he never ceased talking about that—the recognition and opportunity he could have. This sort of thing didn’t happen in Germany. And yet we got the feeling that he was also proud of his German association. Q. You say he spoke German in the worship service. Did he learn English, too? And he meant it! I kind of resented that, because, when I started school in the country school, I could not speak the American language. Schwengel returned to Iowa after graduating from college and teaching for a few years. 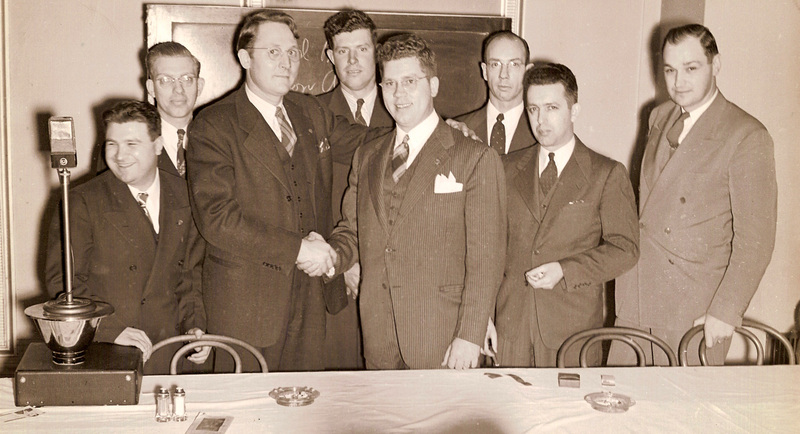 This early 1940s shows him (3rd from left) with the Jaycees, one of several benevolent organizations to which he belonged. Fred, of course, learned English and went on to high school—leaving home and boarding with neighbors because his father objected to him going to school when his brothers stayed home to work on the farm. After attending college, teaching history and civics in high school, establishing a successful insurance practice, and entering politics, Fred and his father would reconcile. As these brief excerpts reveal, Fred would come to understand the influence of his German heritage and his father’s immigrant experience on his own development. As a member of Congress in 1962, Fred Schwengel would lead the effort to establish the U.S. Capitol Historical Society. The Society plans several programs to observe its 50th Anniversary in 2012. Among them will be posting the complete audio recordings and print transcripts of Fred Schwengel’s oral history interviews. Look for those in early 2012 at www.uschs.org. As you must all know by now (and if you don’t, you do now! ), we at the U.S. Capitol Historical Society in collaboration with the German-American Heritage Museum recently unveiled our joint exhibit on German Americans in the first and 112th federal congresses. It was on display in the Cannon Rotunda from October 4th through the 7th and will make its way over to the Russell Rotunda for the week of October 24th before being displayed at the German-American Heritage Museum in December, and finally becoming a traveling exhibit after that. While we’ve posted a few times about this exhibit, offering previews and excerpts of the information contained in the panels, we thought it might be a nice change to look at some of the many German Americans who served in the Congress in the 19th and 20th centuries. I found a number from which to choose, with one in particular catching my attention—Gustav Schleicher. Schleicher was born to a cabinetmaker in Darmstadt, Hesse in 1823. Schleicher went to school for and trained as a civil engineer assisting in German railroad construction. Schleicher and another man, Dr. Ferdinand L. Herff, were leaders of a group of intellectuals who immigrated to Texas and founded a commune, Bettina (after the German literary figure, Bettina von Amim), along the Llano River in 1847. The main thrust of the community was to prove the truth of communism and to offer a path of hope in the wake of spreading revolutions throughout Europe, culminating in the unsuccessful 1848 revolutions in the German confederation and elsewhere in Europe. The community experiment, not surprisingly, failed and left Schleicher disillusioned. In 1850 Gustav Schleicher moved to San Antonio, where he and some others began the Guadalupe Bridge Company with the goal of building a toll bridge across the Guadalupe between San Antonio and New Braunfels, as well as building the San Antonio and Mexican Gulf Railway. In 1852, Schleicher became an American citizen, and in 1853-54 he was elected to serve in the House of Representatives of the Fifth Texas Legislature. 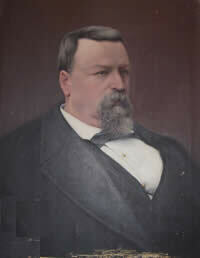 Following his stretch in the Texas House, Schleicher would involve himself in numerous business ventures, acquiring vast swaths of land and cofounding the San Antonio Water Company in 1858 and Alamo College in 1860, as well as serving in the Senate of the Eighth Texas Legislature from 1859-1861. Prior to the Civil War, Schleicher often allied himself with Democrats such as Sam Houston in supporting the Union, but after secession that would change as he became an advocate of the secessionist movement and a Captain in the Confederate Army. He also tried and failed several times to recruit an entire company of fellow Germans for Sibley’s Brigade (Sibley, a Confederate brigadier general, put together several regiments for a campaign turned debacle in New Mexico during the Civil War). After the war, Schleicher practiced law in San Antonio; in 1866, he was one of the incorporators of the Columbus, San Antonio, and Rio Grande Railroad, serving as the engineer for the construction of the Gulf, Western Texas and Pacific Railway, which ran from Indianola to Cuero (he founded the town of Cuero as a way station and moved there in 1872). In 1874, the Democratic Party nominated Gustav Schleicher (he did not solicit the nomination) and subsequently elected him to serve in the U.S. House of Representatives representing Texas’s Sixth District. According to the Texas State Historical Association, his first order of business was the installation of an elevator in the House; more importantly, however, he became very well known for his well-researched and well-considered opinions on such issues as the restoration of the gold and silver standards and his support for the protection of the Texas frontier with Mexico. In his first term he served on the committees of Indian Affairs and Railroads and Canals, while in his second term he added a seat on the Committee on Foreign Affairs to his résumé. As he was getting ready to run for reelection in 1878, he received a strong challenge from someone in his own party due to his somewhat unpopular position on a stable currency, nearly losing reelection after a long and bitter campaign (sound familiar to anyone who follows politics today?). Sadly, however, Schleicher never got the chance to take his seat for his third term, passing away suddenly in Washington, D.C. on January 10, 1879. Despite starting out on the far left of the political spectrum in his experiment with the Bettina commune, he soon learned the downsides to such a collectivist doctrine outside of the theoretical world and spent the remainder of his life as a conservative, in fact maintaining most German immigrants were as well. Gustav Schleicher was a hugely popular figure in both Texas and Washington; he was laid to rest with much pomp and circumstance in the U.S. National Cemetery in San Antonio, Texas, and Schleicher County in West Texas is named in his honor. The contributions made by German Americans to American society and specifically to the United States Congress cannot be overstated—Gustav Schleicher is merely another example. And while many German immigrants originally settled in places throughout Pennsylvania, Ohio, and Virginia in particular, it is interesting to see that later generations sought new opportunities in places like Texas too. Be sure to stay tuned as we continue to add to this series in our blog, examining more German American members of Congress from both the 19th and 20th centuries and the many positive things they have added to our American experience. If you’re interested in reading more about Schleicher or any other important Texas historical figure, visit the Texas State Historical Association website at: http://www.tsahonline.org. Since we’ve weighed in about some of the prominent German Americans who have served in Congress, why don’t you tell us which German immigrant or German American (not necessarily an elected official) do you think has most positively impacted American society?